The task was to design a major 300-bed facility with student amenities and services, located on a spectacular hillside site strewn with large boulders deposited by glaciers in the last Ice Age, and overlooking a beautiful pond which separated the site from the main academic campus. This 300-bed residence hall was the first major dormitory project designed by PS&S, using all of our disciplines. 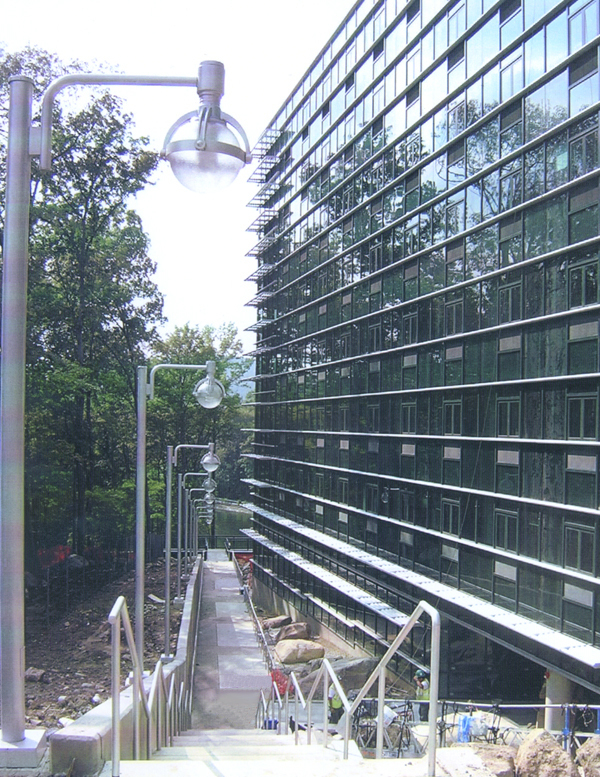 Although the Ramapo Campus is very large, there were very limited opportunities for the siting of large new buildings due to wetlands issues. The site occupied an extremely narrow slice of developable land between two wetlands buffers on a steep hillside (too steep for a handicapped-accessible sidewalk), with a silted-up pond that was no longer ecologically viable. The site backed up onto noisy Route 287 at the top of the hill. The dorm was organized into a narrow multi-story bar, set into the hillside and reaching as far down the hill as possible. The entrance was located in the center of the building, making the access walk up the hill just long enough to avoid switchbacks. The long axis of the dorm ran directly east and west, creating long south and north elevations, optimum for the solar strategies that informed the exterior wall design. Lounges and study rooms were placed at the end of the bar, which provided sweeping views of the Ramapo Valley. The ground floor, essentially one large lounge, was broken into a number of sections that stepped down the hill, providing dramatic views of the pond. The site boulders were used as “sculpture” to retain the slopes adjacent to the dorm. The pond was dredged to provide storm water storage, the extra depth making it again viable for fish and wildlife. This design, integrating all of natural features of the site, won five different design awards in the year that it opened.